Completely getting rid of rabbits from an urban environment is not a goal that can be achieved. Rabbits have adapted quite well to their new urban environments, and who doesn’t like those cute little buggers bopping about from one yard to the other? I’ll tell you who doesn’t enjoy rabbits; two people: gardeners and landscapers. Why? 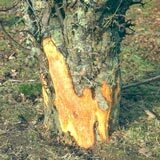 A prominent pop culture cartoon has already provided the reasons why gardeners don’t like rabbits (they’re so darn mean to the ducks), but rabbits can also cause a great deal of damage to newly planted trees, shrubs, and other foliage that landscapers like to use to spruce a place up. Rabbits not only have a penchant for feeding on very young seedlings, bulbs, certain flowers, but a whole host of shrubs and trees as well. Rabbits really will feast on just about anything nature provides, provided they’re hungry enough. So, how do we control rabbits if rabbits cannot be completely gotten rid of? Well, that’s precisely what I intend to examine in the following article: how to get rid of rabbits, or at least control the damage rabbits might do to your home and garden. Rabbits prefer oaks, maples, basswoods, and willows to most other species of tree, but this does not mean they will feed on these trees alone. Rabbits will eat just about anything when they’re hungry enough. However, it’s important to identify rabbits as the problem before attempting to control them. To the right are a couple pictures of signature rabbit damage. If you see markings or bite marks like this in your garden or around your yard, the chances are good that you’re dealing with a rabbit. Or, if you prefer, a wascally wabbit. Elmer Fudd’s tried and true method for getting rid of rabbits is perhaps the most effective form of rabbit control. Unfortunately, shooting rabbits poses two problems. First, there may be laws that protect rabbits in your area from being killed. Secondly, if you’re living in an urban area or suburb, the use of firearms is probably prohibited. And thirdly, shooting rabbits is not the most humane way to deal with a rabbit problem. Hell, I’ll probably get a couple of angry emails from the folks at PETA for even suggesting it. Kill traps are perhaps the second most effective way to get rid of rabbits. Again, you’re going to have to find out whether or not this is legal in your neck of the woods, and you’ll have a couple of things to take into consideration before you decide to trap the rabbits. First, are there any smaller animals (particularly curious outdoor pets for example) in the area you might accidentally kill? Secondly, do you really feeling like killing an innocent little rabbit just because he or she found the vegetation in your yard the most delicious? Shouldn’t you be flattered instead of angry? Well, there’s another option. Live traps are the most humane option for getting rid of rabbits next to lethal traps or shooting the rabbits. Live traps are good because they don’t present any physical danger to any other animals or children in the area. Not only that, but you’ll avoid the clean up necessary with a kill trap. Live rabbit traps aren’t very expensive, either. Havahart makes some really great live traps that I’ve used with great success in the past. Better yet, if you have a friend who lords their country living and perfect garden over you ever chance they get, then you probably know of a perfectly suitable place to relocate your bushy-tailed friends. You can get Havahart live traps at Amazon. Fungicides that contain the chemical Thiram are an excellent form of non-lethal rabbit repellent and control. Thiram is positively revolting to rabbits and they will usually leave any plants sprayed with Thiram well enough alone. Application of this fungicide is relatively simple. You simply spray it on the plants that you don’t want the rabbits to eat. Problem is, it can only be used on ornamental plants because of its toxicity, and it requires multiple treatments between rains or every two weeks, whichever comes first. Fencing off individual plants and trees is a more efficient means of rabbit control than fencing off an entire yard.Fencing really is the only other non-lethal form of rabbit control. Fencing off individual plants and trees is far more cost effective than fencing off an entire lawn or garden and it requires a lot less maintenance in the long run. But, if you’re going to be fencing you need to bury that 1″ mesh chicken wire about 10″ deep and make sure it’s high enough to prevent the rabbits from jumping over. There are a number of rabbit traps on the market today, but most live traps like those made by Havahart or Cooperseeds function in much the same way. Here are some basic tips for trapping rabbits with a live cage trap. Rabbit traps should be washed with soap and water or with bleach and water to get rid of any human smells on the traps, and to get rid of any urine or defecation left in the trap by previously trapped rabbits. Handling the traps afterwards should be done with gloves to prevent oils from your hands being left on the traps. Traps are best left in areas where rabbits seek shelter or food. Putting a trap out in the middle of your lawn is likely to be less effective than leaving the trap near some bushes or a garden. Use common sense and your instincts when deciding where to lay the trap. Check the trap often. You don’t want to leave a rabbit or any other animal you may have accidentally captured out in the elements for too long. You’re not trying to traumatize the animal; you’re trying to remove it to be a better location where it will find a better quality of life outside of the city. Put a cloth sheet over the trap to help prevent additional trauma to the animal during transportation.Once you reach your release point, lift the sheet away from the trap door, unlock the door, and walk away from the trap. Don’t mess with the trap or jiggle the trap until the rabbit has left willingly. Oh, and peanut butter is a good bait for rabbit traps, in case you were wondering. Groom your lawn and keep your yard trimmed as a way to make your property less attractive to rabbits. Remove any piles of stones, thick bushes, brush, piles of wood, or anything else rabbits might use for a den. 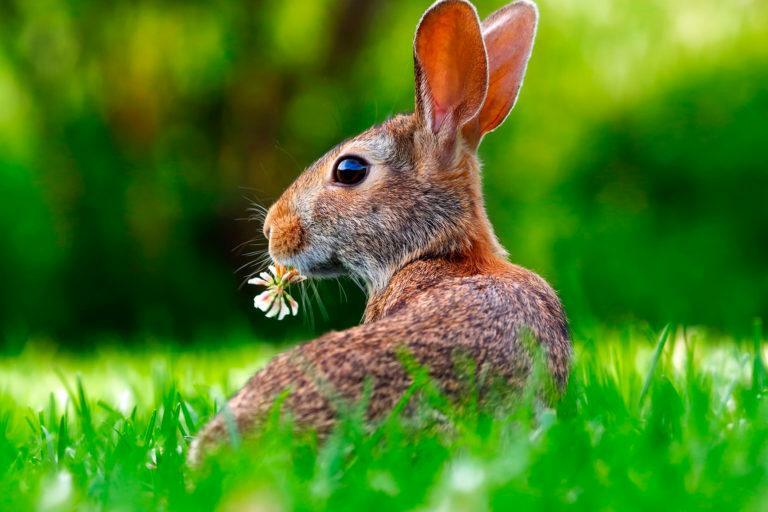 Rabbits love debris left in lawns because it provides places to hide while they move from one yard to another, and anywhere a rabbit feels safest it’s likely to take up permanent residence. Plant Pro-Tec UNITS are a relatively new rabbit repellent on the market today. The manufacturers claim that it uses Garlic scent that is quite a bit stronger than normal garlic juice. How they do it, I don’t know. I imagine they’ve found a way to time release concentrated amounts of the sulfur compounds in garlic that cause the odor we’re all too familiar with. Apparently you clip them to the plants you want to keep rabbits away from. Amazon sells 25 counts of these anti-rabbit clips for a reasonable price.